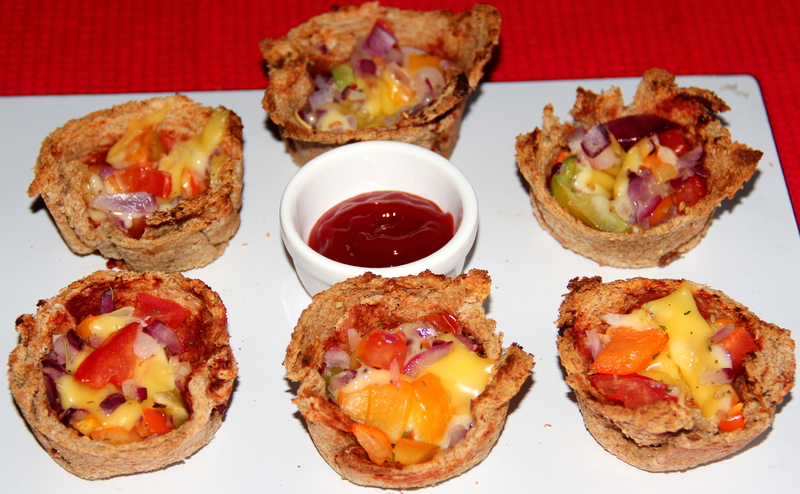 Bread pizza cups are an easy and delicious snack where bread slices are mould to a cup shape in the muffin tray and topped with favourite toppings. This can be served for the breakfast/ for evening snack with a cup of coffee/tea. Pre-heat the oven at 180deg c, coat a muffin tin with cooking spray and set aside. In a bowl combine tomatoes, capsicum, onion, salt mix well and set aside. Cut the crust of the bread slices and use a rolling pin to flatten out each slice individually and press the flattened bread into the tins, spread some sauce and scoop the mixture , sprinkle some cheese into each bread cups and bake it for 8-10minutes/ until the crust is slightly golden colour . Allow it to cool a bit before unmoulding. Tomato ketchup can be used instead of pizza sauce. Posted on August 16, 2014, in Appetizers, Breakfast, Indian, International, Kids recipes, Starters and tagged Bread recipes, Chitras healthy kitchen, drchdietfood, Pizza cups recipes, Pizza from bread, Pizza recipes. Bookmark the permalink. 26 Comments. Love this idea, very cute for parties too! Great…idea to use left over pizza gravy…I always have gravy left after pizza night and don’t know what to do with it…thanks Chitra for the idea..
Thanx Rani for your visit and feedback…. Ya these a kids friendly. ..thanx for your visit and feedback Shobana….